Because of the popular belief that in order for length to be retained, wearing a protective style must be the rule and not the exception that a natural abides by, according to many. Because of the popular belief that in order for length to be retained, wearing a protective style must be the rule and not the exception that a natural abides by, according to many. When I went natural, length is really all I heard about. It would have been unheard of to voluntarily big chop a second time, or to choose a short, tapered cut instead of longer hair. Thankfully, the natural hair game has changed and bit and are becoming less rigid, although many still hold on firmly to the 'old testament' teachings. However, w e now know that protective styles don’t always yield long lengths and, that when they are not done the right way, can even result in significant damage being done to the hair. Many naturals choose to rely on low manipulation hairstyles instead of protective ones in order to achieve their hair growth goals with great success, but protective styles remain a big deal for many. Let’s take a look at what makes a protective style actually protective. When we speak about protective styles, we are really speaking about styles that protect the ends of our hair. The ends of our hair are vulnerable because they have been around the longest and subjected to the most stressors. The ends have been subjected to the most detangling, brushing, pulling, tugging, heat, cold and chemicals. After years or even months of all that, it really is no wonder that our ends are fragile and require our protection. Therefore, for a style to be truly protective the ends of the hair need to be tuck away and hidden from potential sources of stress. Popular protective styles include updos, twists, and braids. Updos pin up and tuck away loose natural hair or hair that’s been twisted or braided in a manner that pulls all the hair away from the face and off the neck, shoulders or back. While updos can be done loosely or with a firmer hand, they are never supposed to be tight or cause any tension or discomfort on any part of the hair or scalp. Examples of updos include buns, roll, tuck and pins and chignons. These styles tend to be favored for more formal occasions where elegance is required, but can be tailored to more casual looks. The fact that the ends of the hair are completely hidden away is what makes updos actually protective. Wigs offer quick and easy styling options and keep the entire head of hair covered in the cases where a full wig is worn. There are also half wigs which cover only a portion of the head, giving the option of blending the front of your hair with the wig. Full wigs are therefore better protective styles as all of the hair is covered and there is no need for manipulation and blending. Wigs can be harsh on the hairline, may dry the hair out and even create friction between the inner materials of the wig and your hair, so wig caps should be worn and the wig should be secured in a manner that does not create stress on the hairline. This is a technique that allows the wearer to achieve a number of styles and is so popular that it is constantly being improved upon. Initially, crochet braids were installed into hair that was cornrowed in whatever pattern the wearer chose. But today, new techniques for installing crochet braids without cornrows have also been developed. Crochet braiding can be done with loose curly hair extensions, straight hair extensions, faux locks as well as different types of braids and twists. Crochet braids are protective due to the fact that the ends of the hair are completely tucked away and therefore protected from the stresses of regular styling, the environment, and manipulation. Like wigs, these and single braids and twists with extensions, allow the wearer to rock hair of different lengths, textures, colors, density etc. 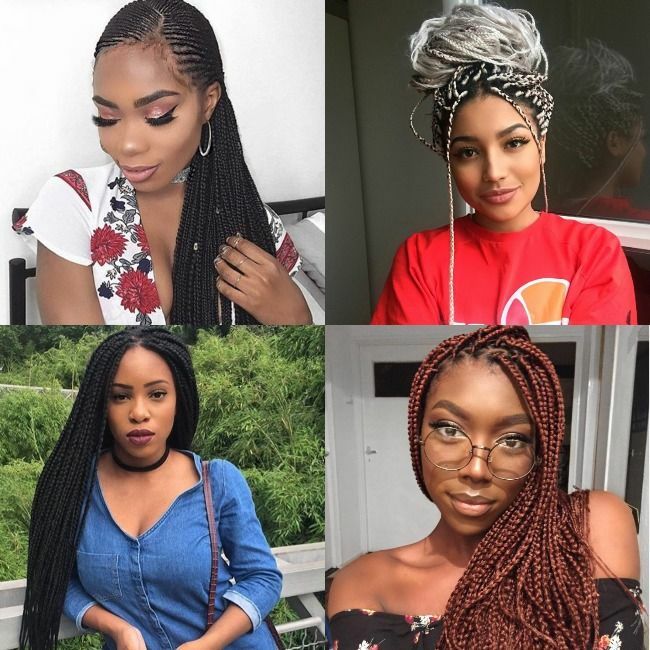 These protective styles allow you to have fun with hairstyling and get creative without the risk of damaging your hair. As you would have realized, protective styles are only protective if done in a manner that does not stress the hair or otherwise create conditions that lead to damaging your own hair. The hair also still needs to be maintained and moisturized when placed in a protective style. When protective styling, “out of sight, out of mind,” is simply not a good hair philosophy to live by. Do you swear by some form of protective style? Tell us what works for you, and post your fave protective style on StyleNook. This is how to have less breakage from your protective style. If you wear protective styles, it's important to care for your hair before, during and after. This is how.